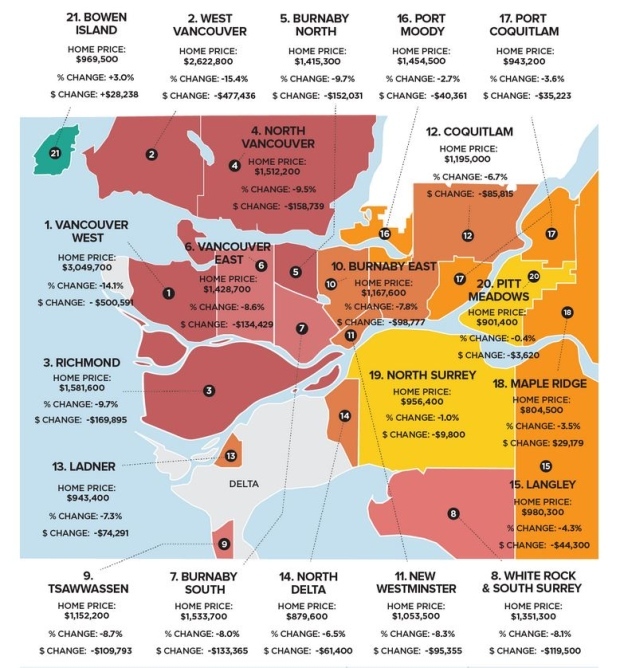 It's no secret that home prices across Metro Vancouver have been falling in recent months, but a report released Wednesday by a real estate website is shedding new light on exactly how different parts of the region are being affected. According to calculations from Zoocasa.com, the effect has been most dramatic in Vancouver's West Side. The benchmark price for a detached home in that part of the city fell by more than 14 per cent—or about $500,000—between January 2018 and the same month this year and now sits at a little over $3 million. 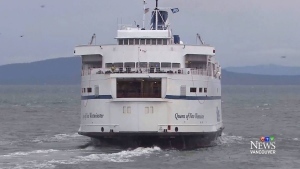 West Vancouver was second on the list with a decline of 15.4 per cent or about $477,000. The average price of a house in the North Shore municipality was about $2.6 million at the time of Zoocasa's survey. Homes in Richmond saw a decline of around $170,000. At a benchmark price of nearly $1.6 million, the city was the third-hardest hit by depreciation over the last year. 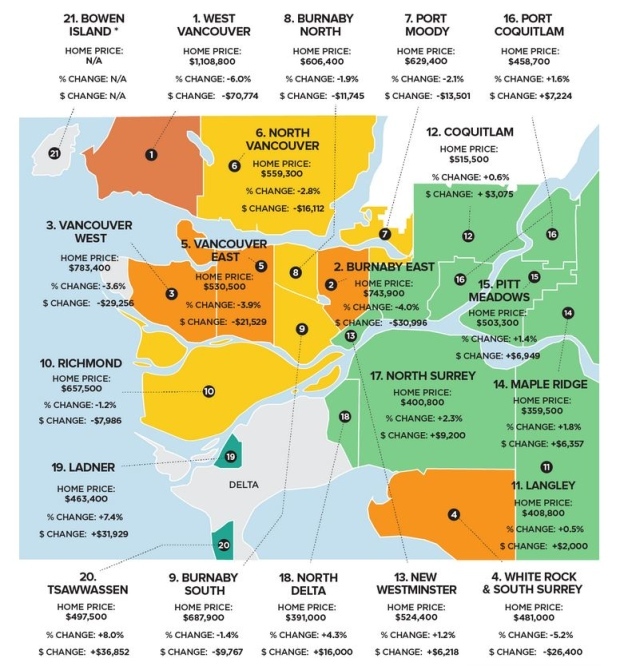 East Vancouver, Burnaby South, South Surrey/White Rock and Tsawwassen all saw a decrease in benchmark values of more than $100,000 during the same period. Port Coquitlam, Port Moody, Maple Ridge, North Surrey and Pitt Meadows were among the most stable markets with benchmark prices falling no more than four per cent in each city. When it comes to detached homes, every part of the region Zoocasa studied saw a decline in prices, with the exception of Bowen Island, which saw an increase of three per cent—or about $28,000—to an average price of $969,500. The region's condo market has proved far more stable over the past 12 months, with prices in the majority of the area Zoocasa studied fluctuating by no more than five per cent. Still, half of those places saw a decrease in home values. West Vancouver topped the list in this category, with the benchmark apartment price falling by six per cent—or about $70,000—to just over $1.1 million. Burnaby East was second with a decline of nearly $31,000. The average condo price in that area was $743,000 in January. Vancouver's West Side saw a similar decrease, with the benchmark there at around $783,000. Despite painting a bleak picture of the real estate market for the majority of Metro Vancouver, Zoocasa's report did offer some good news for condo owners in the eastern and southern parts of the region. In Tsawwassen and Ladner, condo prices grew by an average of seven to eight per cent—more than $30,000 in each case. North Delta saw an increase 4.3 per cent to $391,000 and North Delta experienced a 2.3-per-cent uptick. "At the lower ends of the market where things are a bit more affordable, demands are still boosting price increases there," said Penelope Graham, managing editor of Zoocasa. Langley, Coquitlam, New Westminster, Maple Ridge, Pitt Meadows and Port Coquitlam all saw growth as well, albeit under two per cent. One Vancouver realtor says the decline of foreign investors is partly to blame for the cooling effect. "The West Side housing market…became very reliant of foreign capital flowing in," said Andrew Hasman, whose client finally managed to sell their 1920s character home last week after more than a year on the market and $600,000 less than they paid for it. "All of those buyers have kind of hit the sidelines and without those buyers, prices can only go one way and that's down." The federal government's new mortgage stress test rules and a speculation tax imposed by the B.C. government are also likely having a hand in slowing the market. "There's been a number of policies that have targeted these luxury segments, specifically—the foreign buyers tax and the speculation tax," Graham said. One expert told CTV News this week a decline in sales combined with an uptick in listings usually has the effect of lowering prices. "Eventually, if the house doesn't sell, they're going to have to cut prices," said UBC economist Tom Davidoff. "So, typically when homes are slow to sell this month—that does predict falling prices next month." Overall, the benchmark price for detached homes in Metro Vancouver pulled back 9.1 per cent from January 2018 and is now at less than $1.5 million. That number is $658,600 when it comes to condos and just over the $1 million mark for all property types combined.